Apple added support for reading NFC tags with iOS 11 in September 2017. All iPhones starting with the iPhone 7 offer an API to read NFC tags. 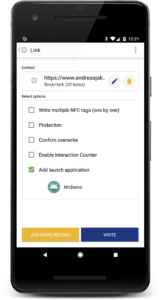 While Android included NFC support for many years, this was the final missing piece to bring NFC tag scenarios to the masses. Short-range wireless communication technology: NFC instantly transmits data over <1 cm (real-life). Thus, it’s easier to say “tap” something. Transmission speeds are slow: the maximum is 424 kbit / sec. Sending an image over NFC would take minutes. So, NFC is only used for short transactions (authentication, room access, payments), and as a trigger for other actions (open web sites, pair with Bluetooth or Wi-Fi). Reader / Writer: the phone reads data from an NFC tag or writes data back to it. The Core NFC API of Apple only supports reading open NFC tags containing NDEF messages. 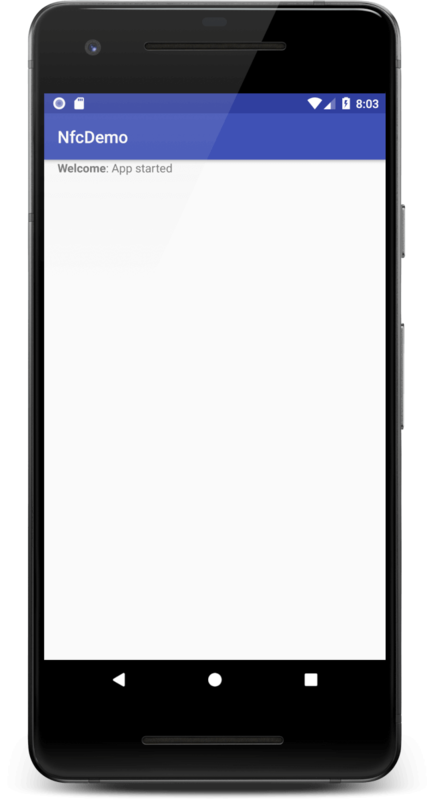 Android phones usually allow reading and writing, giving full access to the tag. Peer to Peer: transmit data directly from one phone to another. Android uses the standardized SNEP protocol (Simple NDEF Exchange Protocol). Google created the branding “Android Beam” for this. Card Emulation: the phone simulates an NFC tag / a smart card. To an external reader device, it could appear like an NFC enabled credit card. 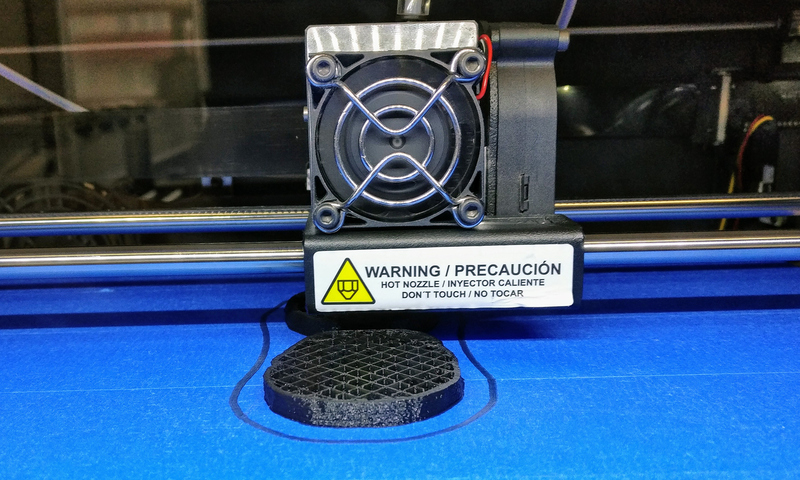 This traditionally required dedicated hardware (a “Secure Element”). Now, it’s also possible to simulate the card from apps. 5 different NFC tag types have been standardized by the NFC Forum. Which one you need depends on various factors: features (encryption), memory size, speed and cost. A common choice for standard use cases is the NXP NTAG, which is an NFC Form Type 2 tag. It’s available in configurations from 144 to 888 bytes user memory. 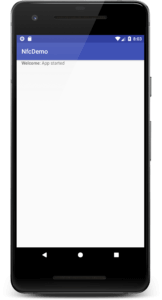 An NFC tag contains a small storage area for bytes. The NFC Forum standardized a content format called NDEF (“NFC Data Exchange Format”). iPhones only support NFC tags that contain NDEF messages. Android fully supports NDEF messages, but also gives you additional options (e.g., low-level tag access). What’s inside NDEF? A tag can contain one or more NDEF messages. Given how small the storage area is, I’ve never seen more than one message on a tag in practice. An NDEF message is composed of 1+ NDEF records. These contain the payload. Depending on the record type, it can be standardized content – like URLs, text, MIME types or handover information. Additionally, it’s possible to define custom content formats. Buy some NFC tags to experiment with. Many specialized NFC stores (like GoToTags) offer starter kits. These contain a variety of tag types, in different physical forms. Now that our tag is ready, it’s time to start with our NFC app. To make your life easier, I’ve created a start project for Android Studio. Download and import this app. Note: The Android emulator doesn’t support NFC. You need a real phone to test the app. Declare Hardware Feature: inform external entities (most notably, the Google Play Store) that our app depends on NFC. If you set required to true, we make NFC support of the phone mandatory. The store only shows the app to NFC capable phones. Either, the user installed the app manually and not through the Google Play Store. In this case, the uses-feature definition isn’t enforced. Even if the phone supports NFC, it might currently be disabled in the settings. If nfcAdapter is null, the phone doesn’t have NFC support. Only if nfcAdapter.isEnabled returns true, we’re ready to go! Ultimately, we want to achieve the following: when the user taps our NFC tag, our app should launch and show the contents of the tag. For launching our app, we use a deep link. In the Manifest, we register the URL of our website (or a specific sub-page of it). This has an important advantage: if the app is not yet installed, you show generic information on a website. That way, you’re always in control of the user experience. Place a link to the app store on that web page to “upgrade” the user. Additionally, this method is fully compatible with the iPhone, which doesn’t support launching apps through NFC tags. 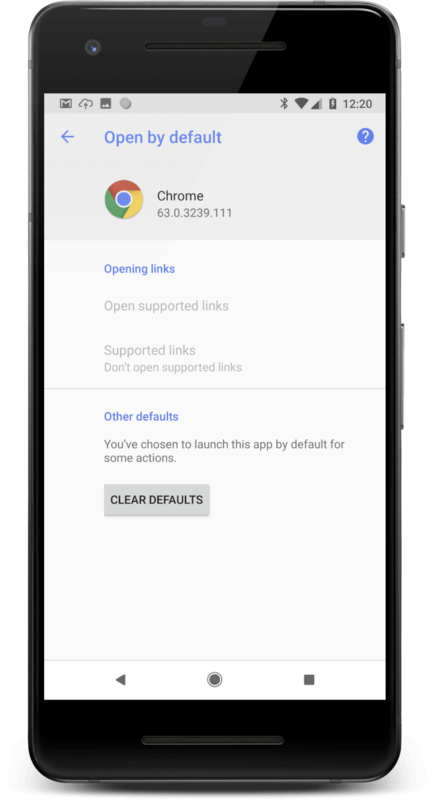 By default, Android shows a user consent dialog before launching your app. To bypass this, place a special JSON file on your web server. 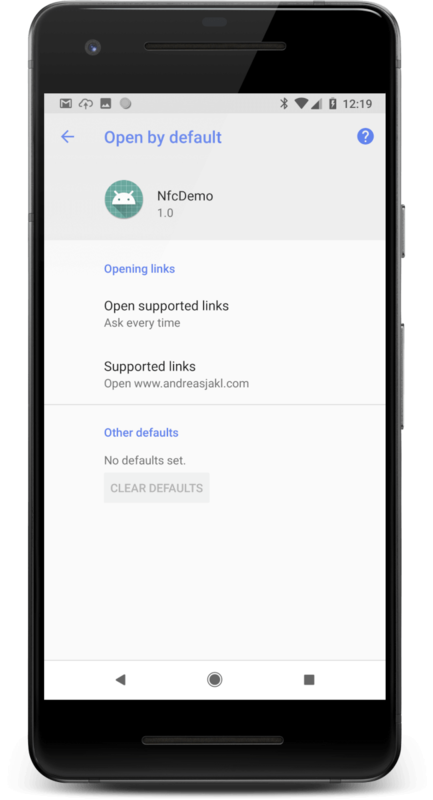 Read more in the Android Documentation about App Links. <!-- Intent filters without data will never be triggered on NFC devices. 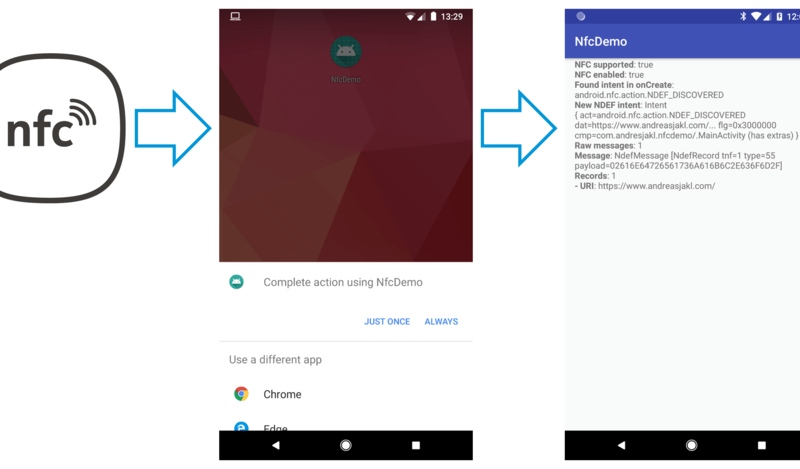 When using NDEF formatted tags, it’s easiest to use the android.nfc.action.NDEF_DISCOVERED intent. Every intent filter requires a category. Supply at least the android.intent.category.DEFAULT category. Android doesn’t allow generic subscriptions to all NDEF messages. Instead, we supply more information on the specific NDEF message we’re interested in. This is done through data elements. Supply at least the scheme and host of your website. To make your filter more generic, it’s a good idea to filter for both https and http. 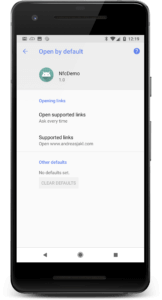 The Android documentation has more information about linking to multiple hosts or subdomains. Now, we have the permission to use NFC. Additionally, we told Android when to launch our application. 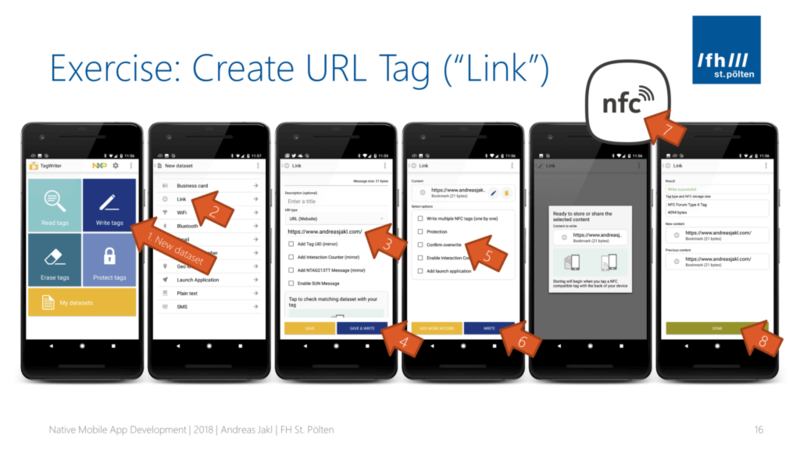 How do we find out more about the NFC tag contents? For example: in a museum use case where each exhibit has its own tag, you’d extract the unique part of the URL. Using the item name or ID found in the URL, you show the relevant information in the app. How does Android deliver the intent to our app? onCreate(): If our app is launched through the NFC tag, Android creates a new instance of our activity. We retrieve the NDEF data through the Activity’s intent property. onNewIntent(): What happens if our activity is already open? By default, Android starts a new activity instance. To prevent this behavior, set the launchMode to singleTop in the manifest. Then, or existing activity gets the intent through onNewIntent() – it’s no longer re-started. In onCreate(), we take the intent property of the activity (getIntent() in Java). In onNewIntent(), we use the intent parameter. Test the app on your phone and place a breakpoint after extracting the NDEF message. Tap your NFC tag. You can see that the message contains a single record. Most important is its payload: a byte array. In the image above, the first byte is 0x02. Writable space is scarce on NFC tags. The most common URI schemes are abbreviated into a single byte, based on a standardized list. 0x02 means “https://www.”. Instead of 12 bytes, you only need 1 byte. If your whole tag only has 48 bytes of storage memory, that’s a big difference. Check the complete list or URI schemes in the NDEF library. The remaining bytes are direct ASCII codes of the URL written to the NFC tag. The URL inside the record is UTF-8 encoded. All the data we need is visible in the screenshot of the inspector window above. Let’s write the code to extract the URL. Note: the following code emits error handling for clarity. The complete solution on GitHub includes checks for ranges and null. Extract information: Android has a built-in function to parse URIs. So, you don’t need to worry about the efficient byte-encoding described before. For all other record types, we log the raw payload. Congratulations, that’s it! Your app is fully functional. It starts through NFC tags and parses & logs the NDEF contents. In case the URL is missing, double-check your manifest. Re-build and re-install the complete app to make sure Android recognizes the intent filter. 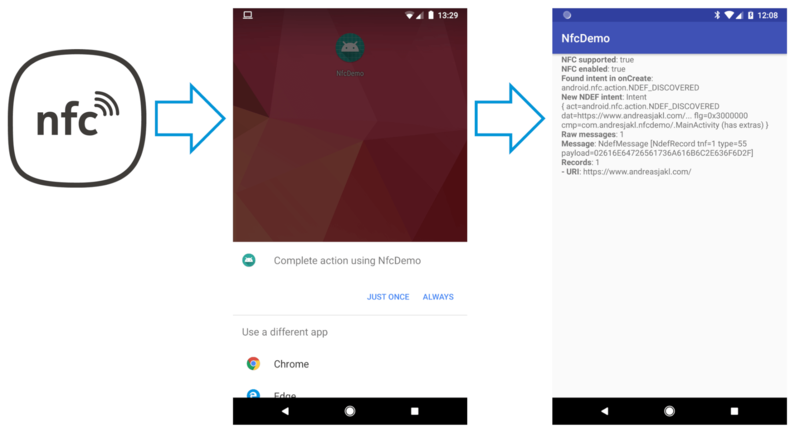 In case you allowed a browser like Chrome – or any other app – to open all incoming URLs from NFC tags, Android might no longer prompt to open our own app. 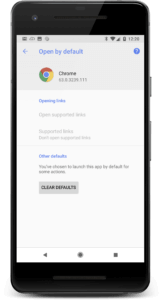 To ensure no other app hijacks your URLs, Android offers another option: the Android Application Record (AAR). In addition to the URL record, you add a second record to the NDEF message. It contains the package name of your app. Android will then always launch your app when it discovers a tag that includes the AAR. In case your app isn’t installed yet, it will open the Google Play Store. Even with an additional AAR, your app still launches the same way. 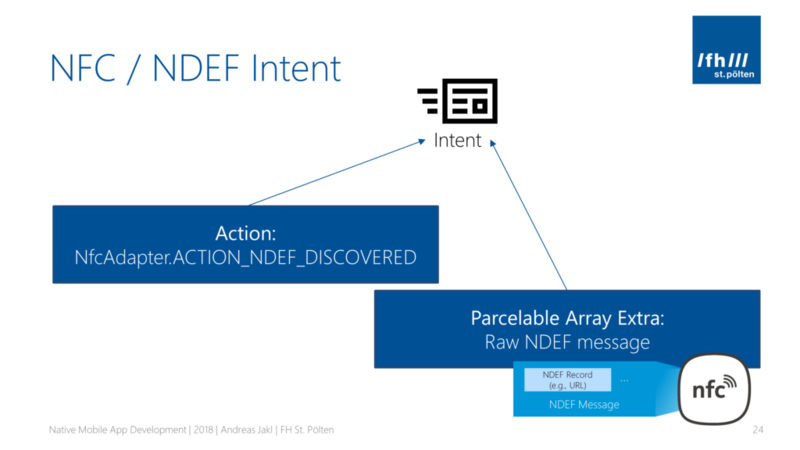 You get the NDEF message through the intent as described before. 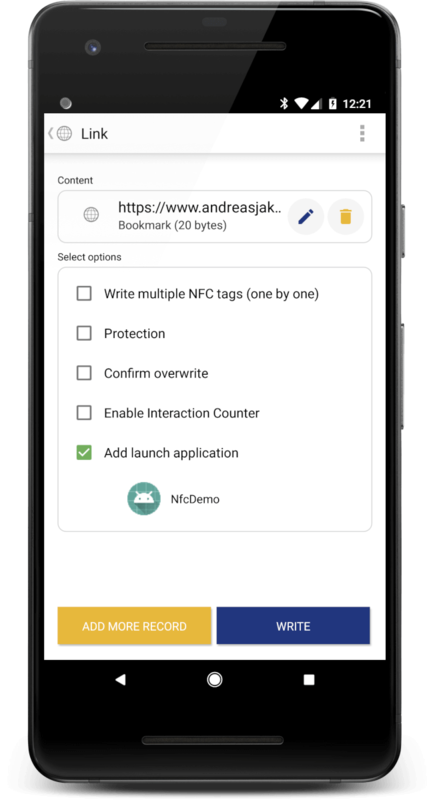 Therefore, it’s always a good idea to add an Android Application Record to your NFC tag if you want a unique association with your app. I’ve further polished the final app. Download the extended solution from this article from GitHub. In addition to subscribing for NDEF messages through the manifest, the project also implements foreground dispatch. 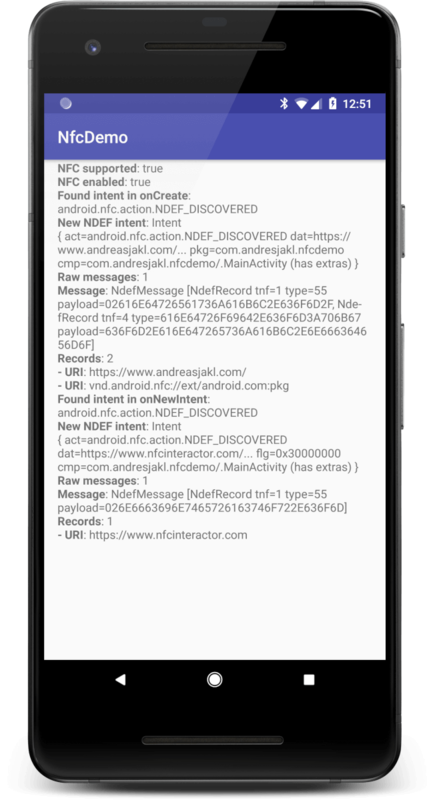 The app gets & analyzes all NDEF messages when it’s running in the foreground. App is launched through NFC (NDEF_DISCOVERED in onCreate()). Delivered & parsed through onNewIntent() thanks to active Foreground Dispatch which subscribed to all NDEF tags.